FREE VALUATION. To buy, auction, sell or consign your Abigail Fillmore autograph that is for sale, please email Nate@NateDSanders.com or call the Nate D. Sanders Auction House (http://www.NateDSanders.com) office at (310) 440-2982. Abigail Fillmore was the First Lady of the United States between 1850 and 1853 and the wife of President Millard Fillmore. She worked as a tutor and teacher, which was how she met her husband. Her appreciation of education and books made its impact on the White House by her establishing the White House library. It is believed that President Fillmore greatly valued Abigail’s opinion and would not make big decisions without first discussing with her. She is remembered for her value of education as she was the first First Lady who continued to work after getting married. 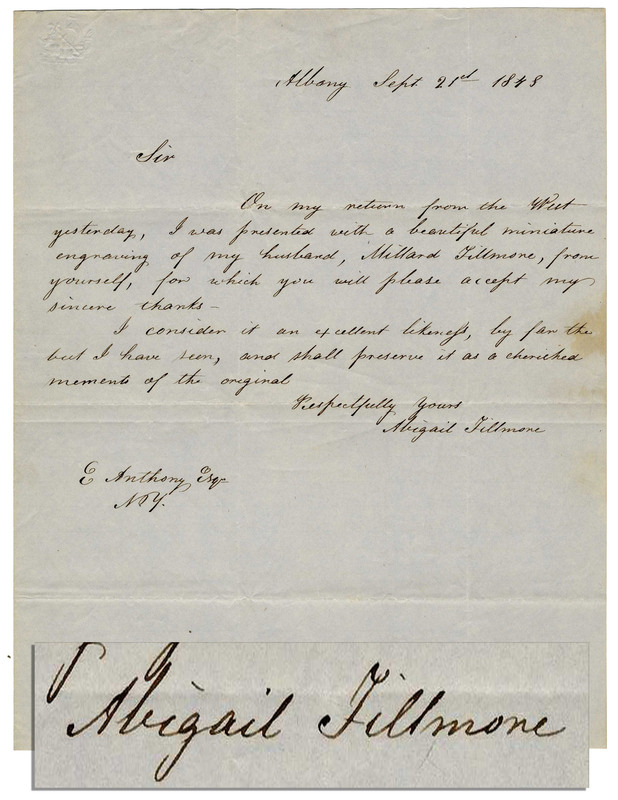 Scarce Abigail Fillmore autograph letter signed, dated 21 September 1848 from Albany. Letter thanks photographer and engraver “E[dward] Anthony” of New York for a miniature engraving of her husband. In part: “On my return from the West yesterday, I was presented with a beautiful miniature engraving of my husband, Millard Fillmore…I consider it an excellent likeness, by far the best I have seen, and shall preserve it…” Signed clearly “Abigail Fillmore”. Single page letter measures 8″ x 9.75″ with minor foxing in spots, else near fine. Sold for $3,682. Abigail Fillmore Autograph Letter Signed. Click to enlarge. FREE VALUATION. To buy, auction, sell or consign your Abigail Fillmore autograph that is for sale, please email Nate@NateDSanders.com or call the Nate D. Sanders Auction House (http://www.NateDSanders.com) office at (310) 440-2982. Please let us know if you have an Abigail Fillmore autograph for sale.